Nick, a boy with the sweetest, gentlest spirit you could imagine. Never a scratch, hiss, bite, or growl out of him, even at his sickest. I doubt we’ll ever again have a more loving furry friend. I made a promise to myself when I moved here and began my blog: its purpose was to focus on the good stuff, to counterbalance the difficulties that come with leaving family, friends, home, career, and country to begin a new life in an unfamiliar culture. But I’m going to break that promise now in order to pay tribute to the life and loss of a little fuzzy guy who constantly restored our faith in humanity, even though he wasn’t human. He showed us that being kind, loving, and openhearted are qualities of a noble soul, no matter what kind of body it’s packaged in. Everyone who’s ever met Jess and Nick has remarked how good-natured they are. 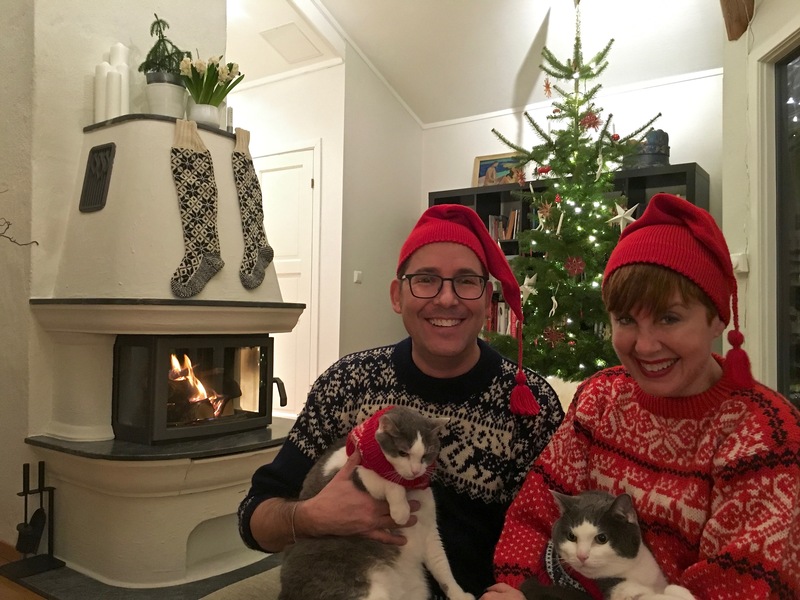 The Norwegian vets who’ve cared for them over the last three years have repeatedly told us that they’ve rarely met such sweet-tempered cats. On our darkest days here, both literally and metaphorically, Nicholas and his sister Jessamine have never failed to remind us of the warmth that can be found in the world. They’ve been our family and our support as we’ve been isolated from loved ones back home and too overwhelmed by work here to make close friends. And their purity of spirit, gentleness, and joy in life have been a healing balm throughout all the challenges we’ve faced these last three years. 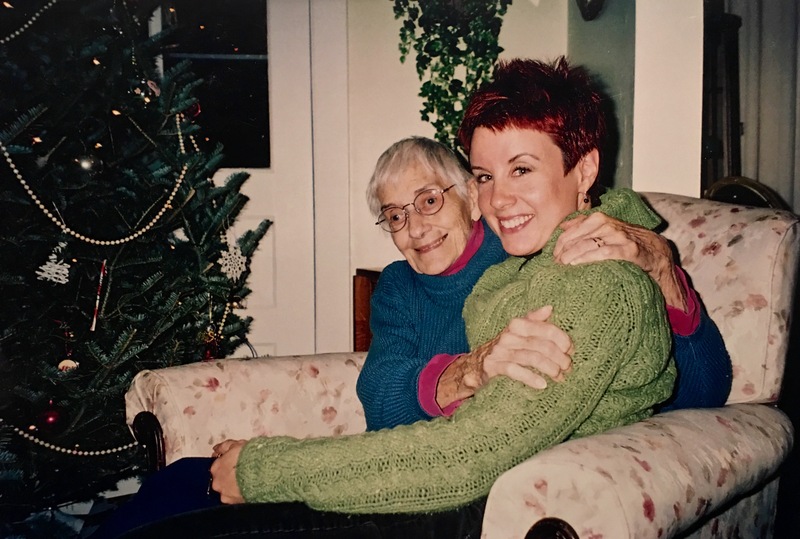 My Granny Doe and I in the living room of our family farmhouse, the Christmas before she got sick. My grandparent’s tiny, two-bedroom home often sheltered my mom, sisters, and I growing up, plus two more when my niece and husband came along. Strangely, even with eight people, it never felt crowded, just safe. The two of them came to us during a particularly rough time in our lives. My grandmother had just been diagnosed with incurable cancer. She and my grandfather, who’d died seven years earlier, had been the mainstay of our family. It was to their home and farm that my sisters and I retreated during our tumultuous, frequently violent childhood. And it was to this oasis of security that I came every year, for every holiday, during my adult life, with Matthew joining me after our marriage. On a sweltering summer weekend in 2007, he and I headed to Kentucky with heavy hearts, wondering if this would be our last July 4th with my grandmother. As we turned onto the one-lane country road, three tiny kittens skittered across the path in front of our car and headed into the shade of a Buckeye tree. We marveled that they were out in such heat, but we continued up the drive to my grandmother’s house, assuming that they belonged to the neighbor at the bottom of the lane. The next day, only two of the kittens managed to stumble weakly across the drive as we passed. The scorching heat was clearly taking its toll so, we parked the car and walked down the lane, searching for signs of life. A sharp squeak brought my attention to a clump of grass on the roadside where one tiny kitten lay curled in a ball, too frail to stand, much less run from strangers. I picked her up, cradling her entire body in the palm of my hand. She gazed into my face with wide-eyed trust as if to say, “I was wondering where you were; we’ve been waiting for you.” No fear at all. How adorable are they? We took this photo the day after we found the kittens, and it totally reveals their personalities. Jess, the ladylike flower, and Nick the chilled-out goofball. The vet told us that another neighbor had rescued and adopted the third kitten the day before. Anxious to get her out of the sun, we carried her up to the house, fed her water via an eyedropper, and gave her some wet food. Mid bite, she fell face first into the bowl, sound asleep. While I tended to her, Matthew went back out in search of the other kittens. For five full hours in 95-degree heat, he combed the fields, finally noticing flashes of white running back and forth in the long tunnel that had formed where grasses had fallen over the lowest fence rail. At just the right moment, he plunged his hand into the weeds, heedless of potential copperhead snakes … and came out with another tiny kitten, a boy this time. Papa snuggles his baby boy, not so little anymore. 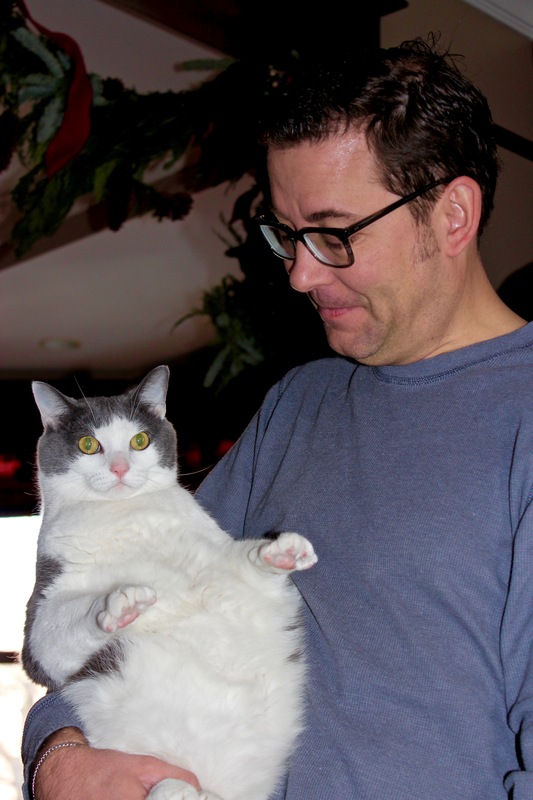 Hard to believe Nick was ever tiny … yep, he liked his meals. The teacup-sized furball gave a single sharp hiss, paws over his head, as if to say, “I give up.” And that was the one and only hiss we heard from him. Ever. In his entire life. During the trip up the lane, Matthew said he just kept telling the little guy, “You’re okay. I’ve got you. You’re going to be okay. I’ll take care of you.” And the look on the boy’s fuzzy face said, “Okay, I believe you. I trust you.” And that was that. Father-son love at first sight. We took both kittens to the vet, who proclaimed them to be relatively healthy, but only five weeks old and still in need of being bottle fed. We finally found our neighbor at home to ask if they were her kittens. She told us that the mother was her Russian Blue, who’d gotten out and mated with a barn cat and had been killed just a few days earlier by a coyote. The woman said she had no use for non-pedigreed kittens, so we could do what we wanted with them. I knew how much work kittens can be. And I knew how much work I’d be facing in the future, caring for my grandmother and the farm. 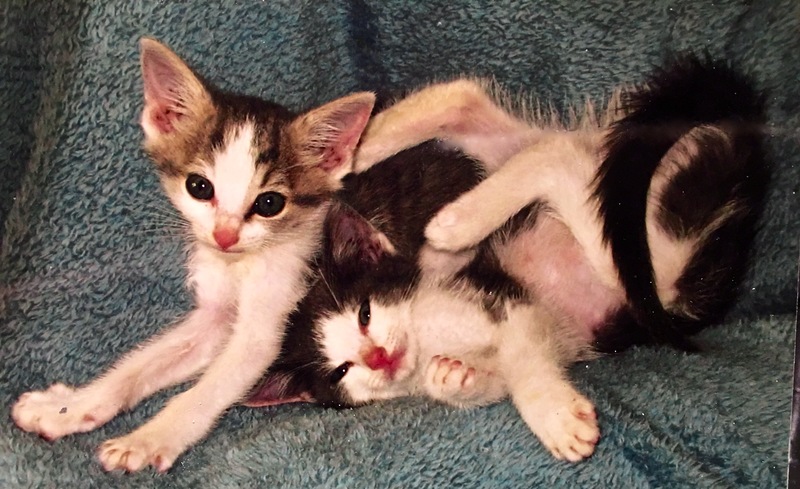 I wasn’t eager to add more to my plate physically or emotionally by taking on the role of mother to two fragile kittens that might not make it. So I’ll be honest; I considered giving them up for adoption. But Matthew convinced me that these two were sent as a blessing, new life from our family farm that would soon deal with death in more ways than one. As the kittens grew, you could see their coloring change. 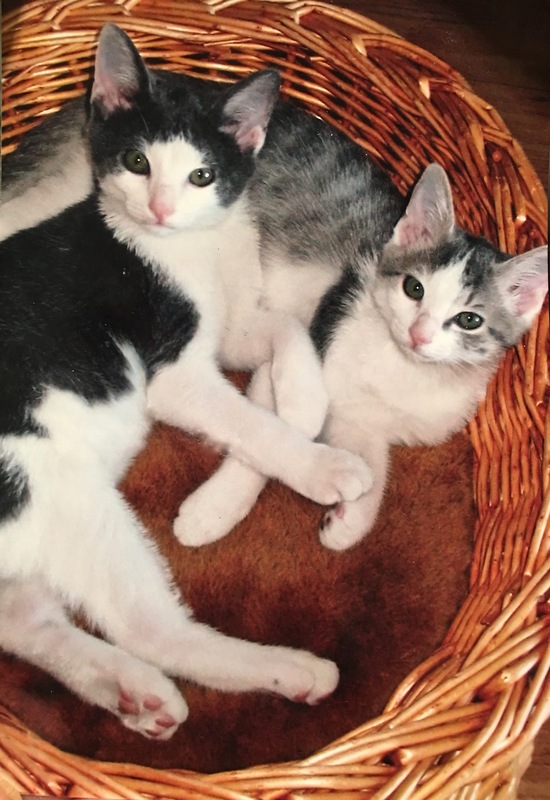 Nick had his mom’s silvery gray fur and green eyes, while Jess had her dad’s gold eyes and white-and-tabby fur. And so we christened our newcomers Nicholas and Jessamine to memorialize their birthplace in the town of Nicholasville, situated in Jessamine County, Kentucky. Nick and Jess went back to Chicago with us, although they became quite adept at traveling, since we drove the 8 hours to and from Kentucky almost every weekend for a year. And Matthew was right, they sustained us through that difficult time of watching my grandmother fade away. The two of them provided us all — even my grandmother, who got permission for them to visit her hospital bed — with hours of laughter at their antics. Granted, the drapes suffered, the furniture suffered, and our clothes suffered from their needlelike claws, which they used like grappling hooks to surmount any obstacle. But they were a welcome joy and distraction through many difficult situations. 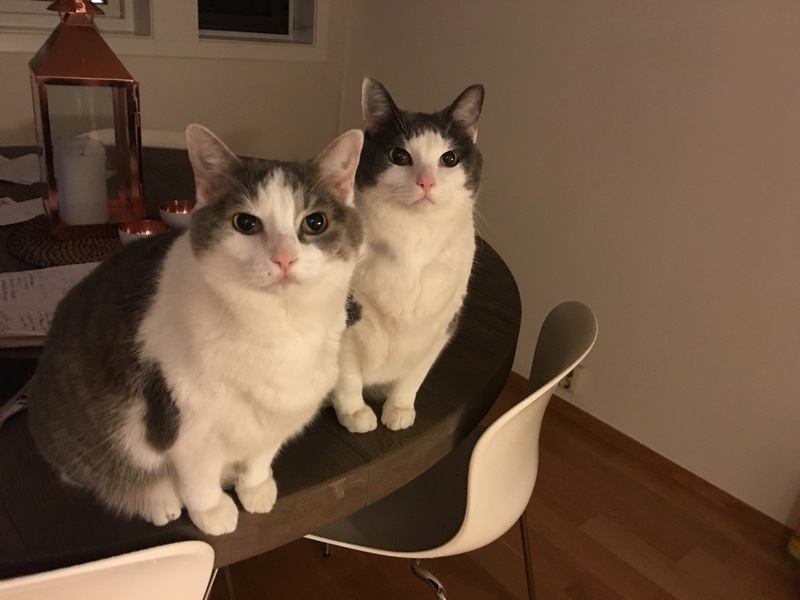 And while they might be considered cats by most people, to us, having raised them from babies, they became our children and vital members of our little family. I needn’t have worried about their ability to entertain themselves in our 5th floor Oslo aerie. Nick and Jess found a way to balance their plump butts on the back of the couch for a view of the school windows and treetops across the street. Kids and crows provided ample entertainment. When the time came for us to move to Norway, I fretted about the 16-hour trip, the vaccinations they’d need, how well they’d handle the long hours of winter darkness, whether they’d be lonely without us because we’d have to work so much, and if they’d get depressed in our Oslo apartment, so high above the street, and with no wide windowsills for perching to watch kitty T.V. — trees, birds, and passersby. But I never for a minute thought that I’d be contemplating a future where one of them might not be coming back with us when we returned home. This year, our Norwegian doctor suggested that we consider doing a blood titer for rabies to see if Nick and Jess still carried immunities, which would negate the need for another inoculation. Something niggled in my brain about having heard that the U.S. had discontinued the necessity of a rabies vaccine, especially from countries like Norway, which have never had a single case of the disease. But Matthew worried that since we’re not sure where his job will take us next, we’d need to have that stamped paper to prove we’d maintained the cats’ annual vaccinations. And so we moved forward with the shot. Within a week, Nick was feverish and sick. An overnight stay in the hospital helped with his stomach, but his left hind leg began to quiver. Soon, he began limping. Within three weeks, he could barely walk. The doctors both here and back home were mystified. Pain relievers and anti-inflammatories did nothing. Steroids came next, but within a month, Nick was almost completely paralyzed in his hindquarters, his tail dangling limply. We had an MRI performed that revealed what appeared to be a blood clot along his spine. Blood thinners replaced the steroids, and Nick seemed to dramatically recover. Even his tail perked up. A second MRI revealed that the clot had dissipated. So we felt secure in taking a scheduled trip back to the U.S. over Thanksgiving, as I had some follow-up medical exams myself to check off, and we arranged to have our dear cat sitters come in four times a day to care for him. 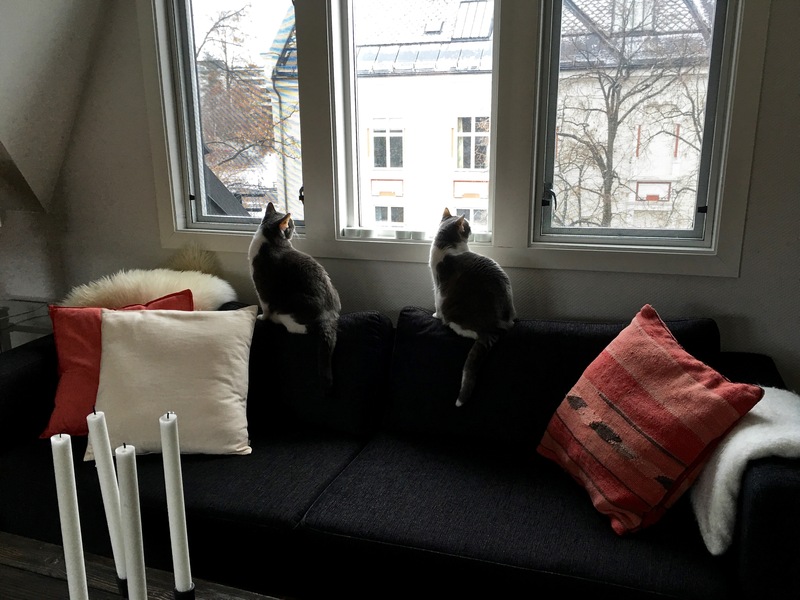 But two days before we returned to Oslo, our sitters called to tell us that he’d suddenly become limp in his front left paw, and that his left pupil had enlarged. 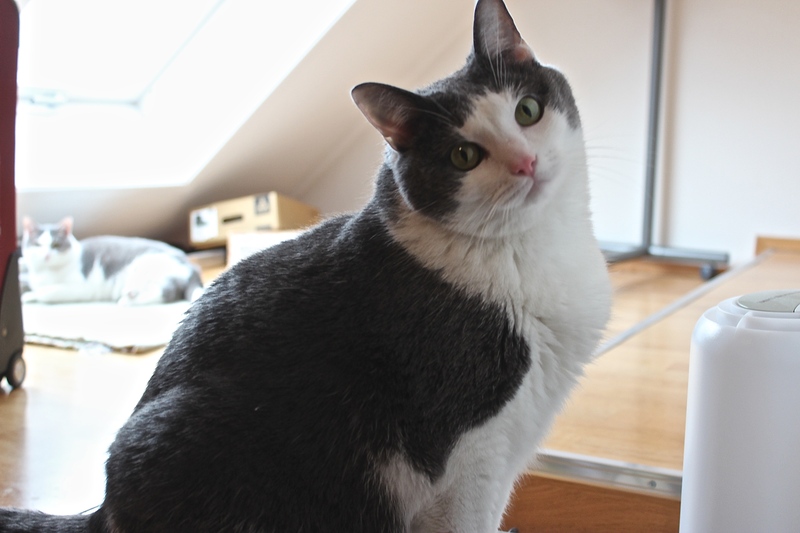 The doctors now suspected that he had some sort of neurological disorder and referred us to Oslo’s Veterinary School. A second look at both MRIs by a neurologist confirmed that what was thought to have been a clot was actually the thickening and deadening of nerves along the spine. Nick had neuropathy as a consequence of the rabies vaccination — an extremely rare reaction. We re-started the steroids and were told to give the drugs a month to work. And so, we spent December hoping for improvement and trying to tell ourselves that Nick would get well; it was just a matter of time. Everything we found online confirmed this. Since early October, our days had been filled with taking Nick to and from various specialists, hand feeding him and squirting water in his mouth via a syringe, carrying him to and from the litter box, performing physical therapy with him several times a day, researching other treatment options online and finding none … and simply worrying ourselves to death. Two weeks before Christmas, we arranged to have my family come for the holiday to bring some hope and cheer to us all. Their visit seemed to be just what Nick needed. He rallied, spending every minute with them, sitting in the middle of the kitchen floor while all the action whirled around him. On several occasions, he even hobbled his way into the living room for cuddles in front of the warm fireplace. But the day my family left, he suddenly grew much weaker. Over the next four days, his voice became a hoarse croak, he went blind in one eye, he could no longer go to the bathroom without intervention, and his body gradually fell completely limp, with every limb trembling constantly. The neurologist confirmed what we’d been fearing: it was unlikely that he’d ever recover. She suggested chemotherapy drugs for two weeks, but predicted that they’d have little effect and recommended euthanasia as the most compassionate choice. I fell to pieces over the idea, but Matthew told me that the night before, when he’d been holding Nick, he’d looked into the eyes of his little boy and saw total exhaustion. He said he’d made a promise to Nick then and there that he wouldn’t let him suffer anymore if there was no hope for a good life. And so we said goodbye to our little St. Nick. We didn’t take a lot of photos of Nick while he was sick; I don’t want to remember him so frail and incapacitated. But I am glad that we took this goofy family portrait for our Christmas card just a few weeks before he died. 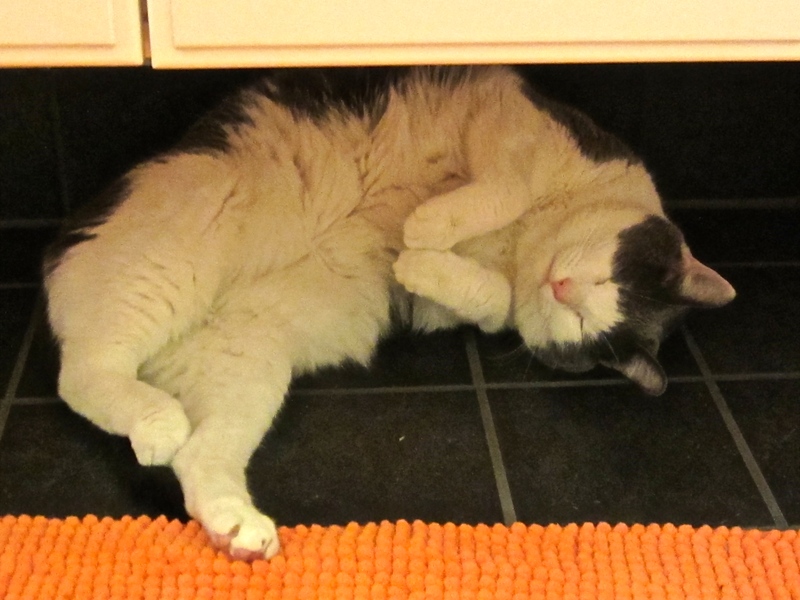 The picture of contentment, Nicki loved the heated floors in our Oslo apartment. On our trips back to Chicago, we’ve been repainting and prepping our home for our return. It’s hard to imagine that we’ll never get to see Nicki sitting in the windows there again. But the house seems so quiet now. Only one kitty to greet us at the door. Only one kitty to feed at night, no more 3 a.m. cries for food (Nick liked his vittles ’round the clock.) No more silvery fur to snuggle my face into when I’m sad. No more big green eyes silently telegraphing me the message “I love you, mom” via slow blinks. No more Tasmanian devil chasing his own tail like a dog. No more crazed games of tag between brother and sister. Jess now prowls the house, looking and crying for him, or isolates herself in the attic window from loneliness. It just breaks my heart. Jess was always our delicate flower, having struggled with eye infections for years. We never anticipated our healthy boy would be the one to pass first. As you can see here, Nicki never met a sink he could resist. He thought they were all designed just for his relaxation. Even the tub was fair game, especially if you tossed in his favorite tinsel ball; then it became the perfect handball court. I miss having to extract him from the kitchen sink before prepping dinner. And moving him out of the way every time I changed the bed linens. He loved jumping beneath the sheets just as I fluffed them over the bed. Everyone says that hindsight is 20/20. You’re not in control of fate as much as you’d like to think you are; bad stuff just happens. And you have to keep going. So that’s what I’m doing. I’m trying to go on with my blogging, hoping that by talking about Nick, I’ll reach some level of acceptance of his death. And I’m trying to remember and record the good times, and be grateful for the fact that my family got to say goodbye to him before he went. I just miss him so much. And I wish it weren’t so damn dark here this time of year. Thank you so much, Mary Ann, hugs back to you! I am sorry for you. I understand you, Kimberly, as I missed my beloved cats Lourinho and Rolando in 2016. Lourinho died due to neurological problems. Twenty days after his death, Rolando died. I am crying now. It is difficult to express my feelings while I write this message. I would like to hug you. Thank you, Kimberly. Your blog introduced us to little St. Nick so tenderly and poignantly. It was sad and touching, but also uplifting to hear how you and Matt are coping. Our fur babies continue to bring joy, laughter, and fun; along with that comes endings and beginnings. Thanks again for sharing your story about St. Nick, I feel like I met him in his good days. Blessings to you and Matt. Hi Lorrie — thank you so much for your kind words. It continues to be a struggle, facing life without Nick, but what’s certainly true is that time only marches forward, never backwards as we’d like. We just keep hoping that, given enough time, we won’t wake up each morning feeling like we have to grit our teeth to face another hollow day of living without our baby boy. I just keep telling myself that things will get better, the grief will lighten, eventually.